Sudden infant death syndrome has dropped by well over 50 percent since the 1994 initiative to have babies sleep on their backs. Overall, SIDS strikes only 0.62 per 1000 babies in the United States. This is great progress, but SIDS is still a leading cause of death in babies. What can be done to protect even more children? The National Institute of Child Health and Human Development (NICHD) continues to sponsor a massive research effort into understanding and preventing SIDS. A large study published in the May 2003 issue of Pediatrics confirms and expands what we know. Sleeping face down, sleeping with a pillow, sleeping on a couch, and sleeping on a soft mattress or bedding all dramatically increase the SIDS risk. The same was true of mothers smoking during pregnancy. Besides sleeping smoke-free, on the back, without a pillow, on firm bedding, what decreased the risk? Breastfeeding (ever or currently) and pacifier use both were associated with significantly lower SIDS rates. Babies who were not currently breastfeeding were about 5 times more likely to die from SIDS than their peers. Babies who did not use pacifiers were 2 to 5 times more likely to have SIDS than their peers. 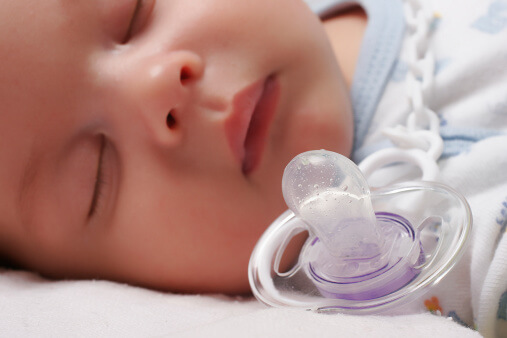 Germany now recommends pacifiers for all babies to help prevent SIDS. The Netherlands recommends pacifiers for babies who are not nursing. While pacifiers have other problems (increased ear infections and a hotly debated connection with decreased breastfeeding), it makes sense to me to consider pacifier use during the peak age for SIDS (under 6 months) – as long as the pacifier is not replacing breastfeeding or causing too many ear infections. What about the controversial topic of babies sleeping with others? Sleeping with siblings or with people other than the parents dramatically increased the risk of SIDS. This study did not find a statistically significant benefit or risk from sleeping with either or both parents – as long as it was on a bed. Sleeping on a couch with anyone was hazardous – even with parents. Other studies have shown that the same was true for waterbeds or when the parents were smoking or taking medications or drugs that might make it more difficult for them to awaken. When thinking about preventing SIDS, keep in mind that when combining risk factors, the risks don’t just add together, or even multiply – they soar. For instance, sleeping on soft bedding increased the risk of SIDS by 5 times. Sleeping on the stomach increased the risk 2.4 times. But those babies that did both had 21 times the risk of SIDS than those who slept on their backs on firm bedding! Understandably, SIDS is a fear lurking in the minds of many parents. Thankfully, when parents combine preventive steps, the power of prevention soars. Parents who don’t smoke, who do breastfeed, and who put their babies to sleep on their backs on firm bedding — without siblings — have real reason to be encouraged. For those babies, SIDS is truly rare.